Eric Kimberling’s car buy versus lease metaphor is a bit flawed. He leaves out things like “gas, insurance, oil changes” which are included in most SaaS contracts. In an on-premise license you have to host the software on your own servers and storage, or at an outsourced data center. In SaaS, it is included and hosted at the vendor’s data center. With on-premise you end up with several application management staff to tune the software, staff help desks etc. With SaaS, most of that is included. With on-premise software, there are regular and expensive upgrades for which you often hire external consultants. With SaaS, it is delivered in background. There are several other elements where SaaS provides better economics and service levels. When you add all that up, in my experience, SaaS does much better than on-premise, and the longer tern the “total cost of ownership” calculation, the better SaaS looks. Now, should Ms. Sutton’s staff have run a competitive bid inviting other SaaS vendors? Could Orlando have done somewhat better? Tough to answer without looking at all the detailed spreadsheets, but you would also need to factor the cost of months of bidding common in government. In the private sector, where most of my experience is, it is tradeoff between time to get started and the potential savings from a competitive bid. 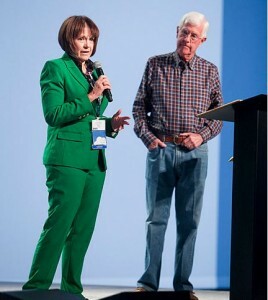 I was in the audience in Las Vegas at the Workday conference and was surprised to see Dave Duffield, the co-CEO invite Ms. Sutton up on stage. I was surprised because in my experience Workday has been adopted by companies like Flextronics with a “fail faster” culture. My book below has a case study on the high-risk, global project Flextronics took on when Workday was in its infancy. My surprise quickly turned to admiration for Ms Sutton for joining the ranks of progressive companies which have adopted SaaS solutions. I live in Tampa, and while our local government does well, I have long admired your city’s ability to scale into a global powerhouse with your fantastic airport, Lake Nona and other projects. I tried to find Ms Sutton to congratulate her but did not manage to. You raise the costs of the team’s trip to Las Vegas. A huge benefit with SaaS that does not show up in spreadsheets is most customers tend to be on the same software release. So their conferences tend to have much more vibrant customer experience sharing than with on-premise vendors where customers are fragmented across releases. So, to me the trip helped introduce the Orlando team to other customers – a nice asset to leverage during the implementation. I would also suppose Ms Sutton took the opportunity, or will at some point, to sell the Workday team on some day moving the event to Orlando. While the Aria in LV is a superb property, your city can compete pretty effectively for that business. Thank you so much for your reply to the Sentinel. I have spent my entire 35 year career either in government as an executive or working with state and local governments in governmental finance or installing and implementing ERPs in governments. I thought it would be good if I could provide some color regarding Orlando’s Workday acquisition. First, I contradict the Sentinel article’s contention that we acquired Workday through a sole source procurement. We used a different approach allowed within our City Code, which is termed a negotiated procurement. When, documentable evidence supports it, we can determine that it is not in the City’s best interest to purchase through a competitive process and submit a recommendation to the City Council to contract without such a process. In this case, Broward College had, within the last 60 days, issued an RFI that had been evaluated by Gartner and concluded that there were no vendors responding to that solicitation other than Workday with an ERP (including both Human Capital Management (HR) and Financials suitable for fund accounting), deployed as a multi-tenant SaaS. that could be confirmed that it is running at other educational institutions. Because that evaluation had recently been completed and both the City’s and Broward College’s objectives were aligned, we deemed it a waste of “taxpayer dollars” to repeat the process when the recent solicitation would serve our needs to identify the best provider. Thus, it was in the best interest of the City to contract with Workday, the successful vendor in Broward College’s RFI and I estimate that repeating such a process would have needlessly cost about $500,000 in contracted and in-kind services. (1) First and foremost, our IT Strategy includes the following strategic goal: Cloud first, when applicable. What this means to us is that we first seek out SaaS solutions in the Cloud and reserve all of our IT resources for mission critical systems for which the Cloud is really not applicable, i.e., police and fire dispatch. Accordingly, we first sought only those systems that could be confirmed to be in the Cloud and whose technical environment has been in operation at least 5 years. Only if not available, would we look for something either run locally or hosted through a managed contract. (2) Due to the exorbinant and prohibitive cost of updating and maintaining ERP software, we desired to use a multi-tenant SaaS solution so that the subscription would cover all future update costs other than the in-kind efforts of our staff to update integrations and begin to use new features. As you well know, such an environment eliminates the ability to modify the software, requiring that all customizations be made in a data layer. This means a migration to a new release requires no technical effort other than to reconnect integrations to other systems. In looking at the costs incurred by other governments for traditional ERP systems this article contends are available and appropriate for the City, we find the ongoing costs for upgrade and maintenance far exceed multi-tenant SaaS costs by millions of dollars. (3) Functional requirements comprised a very short list. Since we are legally able to change our business processes and even our local laws to adapt to the software, we chose to limit our functional requirements to a) a system that includes a complete HR and Financial solution; best of breed was not an option; b) a system that includes fundamental governmental attributes such as fund accounting, budgetary control, and grant management; and c) a system that has clients from education, not-for-profit or government live on either HR or Financial with at least 2,000 employees. (4) The cost of the implementation must be affordable and the annual recurring costs must be less than or equal to our current expenses for the old software that we were running. I was not initially hopeful that this requirement would be met, but, with Workday, we will be spending approximately $17,000 less annually than for our current outdated software. Further, because we have no substantial additional costs of implementation for upgrades other than assigning current employees to address functional improvements and integrations to other systems in future releases, And implementation costs were, at most, less than half of what traditional ERP vendors had submitted to us during our study period. To this date, I have yet to identify a true, multi-tenant ERP solution that meets the requirements above other than Workday, even after reviewing every Cloud-based ERP on Mr. Kimberling’s website. Third, as you recognized, we are a leader among local governments. We were the first government to move to a Cloud based email and calendaring solution. We have recently moved our agenda process to the Cloud. And now, we will be implementing our ERP in the Cloud with Workday. I believe that our new partnership with Workday will have significant benefits, not only to us , but to governments across the country when we have paved the way and they can see the benefits of this approach. This will significantly free our technical resources to concentrate on our police and fire dispatch system replacement coming up in the near future. Fourth, I appreciate your view of the car lease analogy and needing to include fuel and any kind of maintenance, (normal or otherwise). I would go further and say with regard to Workday, it is like a perpetual car lease that provides you a brand new updated car every four months with no mileage limitations. And, we negotiated a limit to the extent that our subscription fees can increase in the future contracting periods, completely negating Mr Kemberling’s argument that there will be major increases in cost after the first subscription period. Finally, I find it curious that so many people demand that government should run more like a business; yet when we do–and avoid spending public money unnecessarily–we are criticized. So, we must courageously make the right decision in a completely lawful way with approval by our elected officials. This disgruntled vendor (BTW, we know who it is) was not selling what we needed to buy; this was proven in the Broward College RFI and confirmed by Gartner, an independent third party. He wanted us to buy a traditional ERP with TCO far in excess of what we will spend with Workday. Francisco next year! And more than anything else, thank you for your support. It meant a lot to me. I look forward to meeting you in person. If you are in Orlando, drop me a line to my email below and I can thank you in person.